Luis Mota, Chief Operating Officer at CARMA shares in this interview his views on Artificial Technology and its impact on the media intelligence industry. Luis also shares his experience with early adoption and if it is worth the risk and last but not least explains why he believes that automation is the future of content creation. Q: Do you consider that AI-driven tracking of news is the evolution of media intelligence? Luis: The Verge tweeted last month that “Putin says that the nation that leads in AI will be the ruler of the word.” This post together with Elon Musk’s claim that “AI is probably humanity’s biggest existential threat,” makes it very clear how AI will dominate all sectors of our society, including the media intelligence industry. It will have an impact on all sides of the business: monitoring, analysis, reporting, interaction with clients, and so on. In fact, technology always has been the main driver of our industry. Either because it allowed a significant reduction of operational costs – making it possible to integrate the concept of economy of scale – or because the technology adds real value to the clients. After scissors, photocopy machines, scanners, databases, internet, big data platforms and business intelligence tools were the most important innovations in the business over the years. Of course, artificial intelligence was the natural next step. I introduced AI in my own business based in machine learning around 10 years ago – about the same time that L’Argus de la Presse did it. It turned out we were both using the same partner. So AI is already an evolution in place in our industry for at least a decade, but it is certainly much more popular and trendy now after IBM, Google, Apple and Facebook made public announcements about their developments in this field and as a response to the volumes of data generated by the social networks. Teaching the machines how to think like we do is having a huge impact in the way the companies from our industry are organising themselves today. It helps us to categorise, index, evaluate, extract entities, summarise, build relationship networks, predict events, anticipate trends or analyse sentiment. The value to the client already exists, but the big transformation is going to be the automation of 60% to 80% of the processes in traditional media intelligence companies. It will allow companies to dramatically reduce operational costs. The economy of scale never had such a potential, to easily grow the business and make it global and be distinctive. My personal perspective is this will be the arena where we’re going to find the next big players – including new entrants, disrupting business models to create new opportunities. The winners are going to be the companies with better accuracy, more intelligence capacity and the ability to deliver more insights. Thus, AI is the past, the present and the future. Every day we have new technology available to support us in better teaching the machines, in a more assertive way – the game is to get as close as possible to perfection, doing the same work as humans, but without mistakes, always using the same logic. 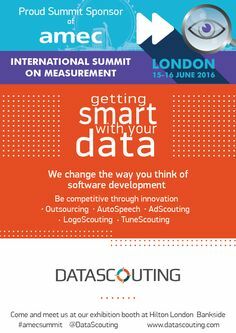 That leads to better consistency and an infinite capacity to process large amounts of data. We can’t effectively analyse on-line or social without it. After all, how can humans analyse the 1.3 million pieces of content shared every minute on Facebook or the 500 million tweets posted every day? Q: Needle in a haystack: Is early technology adoption worth the risk? Luis: I led, for more than 15 years, the innovation and technology side of the business so I might be a bit biased in my answer to this question. I always have been an enthusiast of innovation. From my experience, the early adoption and continued research of new technologies can create disruption and add value. It is a cultural mindset that all the companies should pursue. Early adoption by itself drives decisions regarding a specific technology – but without the culture of innovation, the required agility, and the processes in place, failure is very likely. The question is more if it is possible to survive in an industry that has technology as its main driver without an innovative and disruptive mindset. I would say no. In the field of media intelligence, innovation and early adoption are more than worth the risk and are the pillars of any sustainable and long-term vision. Innovation allows us to build unique solutions and to create distinctive products. This is fundamental for the sales process, client retention and future growth. It generates good will from all stakeholders – clients and internal teams – to build economies of scale that make it possible to be much more competitive on price and to have better financial performance and growth. The important part is to be able to learn, to listen to the market, to understand the clients, and to anticipate the needs. That will certainly lead to stories of success to share. Technology for its own sake, without a good idea or a problem to solve, is worthless. Q: Do you believe that automation is the future of content creation? Luis: Yes, I do – we’ve already seen some cases of success and more will come in the long run with the investments that companies, like Google, are making in it. The funding of project Radar, that will automate writing local news in UK, is a good example. Although, we have a long path to walk through to have machines become creative, with capacity to have a critical approach or to be able to express their own opinions, but the reality is that not all the content that we produce needs to be creative and to have critical thinking. Creating a narrative from numbers requires the opposite: to be assertive, rational and straight – this was the trigger that led Associated Press to automate the quarterly earnings articles. Through automation, AP is providing customers with 12 times the corporate earnings stories as before. On the other hand, the future of content creation, in our lifetime, is going to be mainly about cooperation between humans and machines. Machine learning can play a relevant role on the research side of content generation – supporting journalists, authors, and bloggers by validating facts, gathering different perspectives or to identifying trends in a topic. This will allow human writers to be focused on the intellectual piece of the story. What the future of work will mean for jobs, skills, and wages, from McKinsey Global Institute. Luis Mota started his career at Sabatina, in 1994. In Portugal, Sabatina was the reference in advertising investment data. 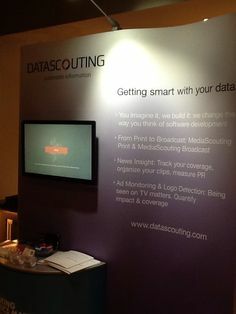 Two years later, and following the idea that information will become more relevant than advertising, he founded Manchete, a company dedicated to media monitoring, to understand the impact of the information in their targets, to manage reputation and innovate by using public information in competitive intelligence field. In 2012, Luis founded INSIGTE, a company with the ambition of creating a cluster of skills in advertising, information and social media, in Southern African Development Community (SADC). In 2015, he joined CARMA as their Chief Operating Officer. Luis has served as Chairman of the Professional Development Committee of AMEC and Chairman of the Analysis Committee of FIBEP. You can reach Luis by email, follow him on Twitter or connect on LinkedIn. CARMA is a global provider of media intelligence solutions. CARMA delivers what matters with people on the ground in 43 countries over 5 continents. The company provides media monitoring and analysis across all types of media including print, online, social and broadcast, allowing clients to make well-informed business decisions. 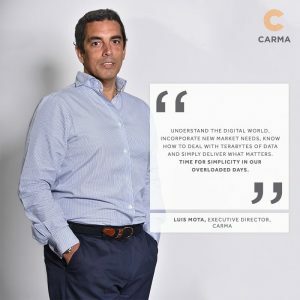 CARMA’s customized solutions combine the latest, cutting-edge technology with unrivalled human insight from a global team of researchers and analysts who provide valuable, relevant and actionable insights. Clients include PR, communications and marketing professionals in all industries in the private sector, governments and NGOs all over the world. For more information visit the company website, follow on Twitter or Linkedin or friend CARMA on Facebook.